Insurance Medical Services. This Kerala PSC Staff Nurse Grade II recruitment of Medical Department will be conducted through direct recruitment. 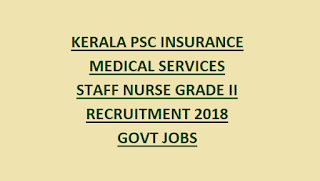 Last date of online applications for this Kerala PSC Staff Nurse Grade II recruitment is 24-10-2018. The selection for Kerala PSC Staff Nurse Grade II Recruitment 2018 is will be in two stages. The eligible candidates can submit online applications through Kerala PSC official web portal only at www.keralapsc.gov.in. For more details regarding selection process, Pay scale, age limits, educational qualifications please see below furnished information. Click here to see the advertisement of Kerala PSC Staff Nurse Grade II Examination. There is no application fee for this KPSC Staff Nurse Grade II Recruitment. (i) A pass in Plus Two/Pre ­degree (with science subjects) Course or Pass in VHSE (with science subjects) or VHSE in Domestic Nursing of a recognized University or its equivalent. (iii) Certificate of Registration with Kerala Nurses and Midwives Council as Nurse and Midwife, in the case of women candidates or as Nurse in the case of male candidates. The eligible candidates age limits are 18-44 years. The candidates only born in between of 02-01-1974 and 01-01-2000 are eligible to apply for these posts. Selection for this Staff Nurse Grade II of Kerala will be held based on written test. To fill the application form online the candidates has to open the www.keralapsc.in website and register for "One time registration" and click on online application. If already registered before apply directly for Staff Nurse Grade II and complete the registration process while filling the required fields. Must have uploaded the scanned photo and image and must provide a valid mail id and mobile number for further communication. Click here to apply online for the Kerala Public Service Commission Staff Nurse Grade II Recruitment 2018. 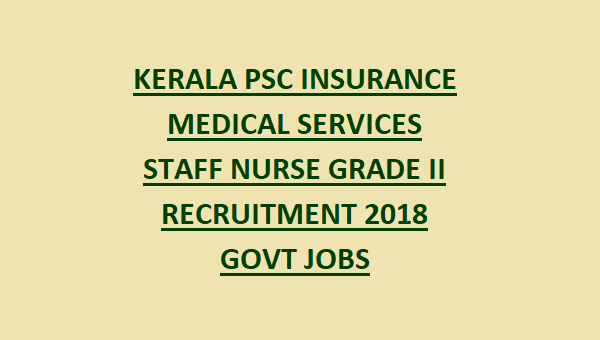 Please share this Kerala PSC Staff Nurse Grade II Recruitment 2018 article to your lovable friends through online social networking sites.